Preschool aged children may begin to make real letters. Letters may occur while a preschooler is drawing or scribbling, typically easy letters first like the letter “O.” Some 4-year-olds may also begin writing their names. Use refrigerator magnets or display letters on their bedroom door for recognition or a sense of ownership of the letters. Writing intrigues preschool aged children. Many young children will ask for help writing letters or words. Preschoolers see writing as an important part of life. 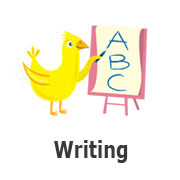 Adults should model writing, drawing, letter formation, and words. When asked show your child how you write. Make writing materials available (pens, markers, pencils, paper). Have your child help make the grocery list or a thank you note to a loved one. Give your child multiple opportunities to write. Write in the bath with shaving cream, outside in the sand, with yogurt on a tray or with crayons at the table. Write letters, words, or scribble for great fine motor practice.